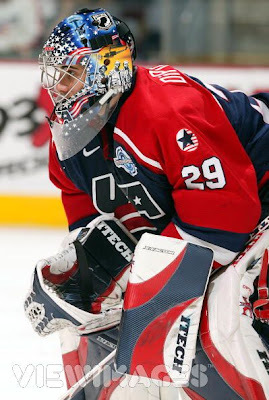 Michael Farber not only kept Rick DiPietro off his list of goaltenders for team USA at the upcoming Olypmics he took a mild swipe writing he never made the big save despite what was an impressive showing in 2006 (1-3 with a 2.28 goals against average) here Thursday. Funny thing was the next season 2007 the same Michael Farber of SI also felt DiPietro was worth of Vezina contention here while last season was an NHL all-star. The only game he gave up more than two goals was the final game against Finland. A bit tough from Mr Farber considering how poorly Mike Richter played in Nagano and for years on the struggling Rangers as he kept getting the starting nod. DiPietro was easily the best goaltender for his country in Turin. Given Brian Burke's recent comments I have little doubt if DiPietro is healthy he will on the roster. No one has brought it up anywhere but if his knee is completely fine in six weeks don't be shocked if DiPietro playing for team USA at the World Championships enters the radar. Whether it be early May or August if he is healthy (big if because if not he needs another surgery and 09-10 becomes questionable) at some point he is going to have to attempt playing. Newsday: Neil Best in the Newsday media blog reports the the Newark Star-Ledger no longer will cover the Yankees and Mets as beats, but instead will use the work of the Daily News beat writers, and in turn will get the beat coverage provided by the Ledger on the Devils and Nets. In theory that means Daily News Kristie Eckert should be freed up from the Devils beat to provide full-time Islanders coverage when Peter Botte leaves to cover the Yankee beat, but we all know that will not happen. Point Blank: Mr Botta has the latest lines/changes from Friday's practice which include Hunter-Streit out for Saturday and Jon Sim likely returning to action. As always please visit Mr Botta's Point Blank for the full details.